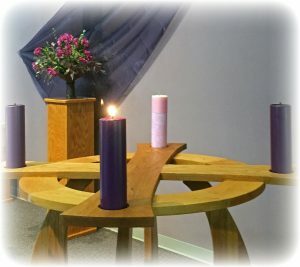 Welcome to Advent and the turning of the year. We join with the worldwide community in revisiting the ancient texts as they interweave with our lives and instruct us in how to make the journey of faith through the year to come. Advent begins with the end times and moves backward in time through promises and prophecies to the Incarnation at Christmas w hen God disrupts and births all things anew. The end of the story may not be an easy place to start when it involves our own responsibility as agents in the outcome. We will hear from prophets that declare realities we might sometimes wish to gloss over or go past by a different route. They confront us with the truth that the way through demands our strength, persistence and courage and that there is no other route. We are welcomed into this Advent — into a different story than the one our culture and world have shaped and to which we have grown accustomed. Creative change and restoration are taking place all around us, excluding nothing. We are urged to take our discipleship in this direction. We will need flexible strength that can tolerate great ambiguity, shaped within the wisdom of and a firm foundation in our tradition to face such challenges and be willing participants in helping to make the renewed creation come. Whether we choose to awaken this Advent or remain sedated by the clamor of this world, all creation groans in showing forth the hour that is at hand. Let us recognize and greet “the days [that] are surely coming”.